Mint. 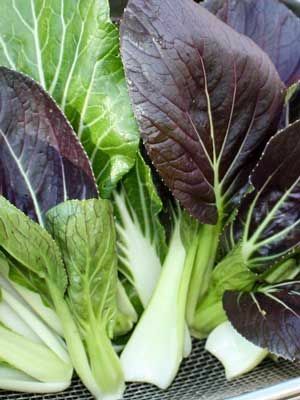 Often planted with lettuce, mustard, kale, escarole, tatsoi, mizuna and other greens found in oriental salad mixtures. Miniature varieties are available for square foot gardens and containers. Sow in double rows, with rows spaced 10 inches (25 cm) apart. Plant seeds 2 inches (5 cm) apart and barely cover them with soil. Gradually thin to 8 inches (20 cm) apart. Miniature varieties can be grown 3 inches (8 cm) apart. This lovely little mustard cousin is fast and easy to grow.